Not all companies manufacture products that require the same amount of overhead, and as a managerial account, you need to be able to calculate the overhead allocation. The following example is relatively simple because each product gets an equal amount of overhead. Suppose a simple factory makes two products — call them Product A and Product B. The factory needs no direct materials (yes, that means it makes products out of thin air; please suspend your disbelief). It paid $1,600 in direct labor to its workers and $400 for overhead, knowing that each product required half of the direct labor costs — $800 each. The $400 in overhead also gets divided equally — $200 to each product. As shown in this figure, the total cost you need to apply (in this case, $2,000) equals the total cost that you apply to your products (again, $2,000). But not all companies manufacture products that require the same amount of overhead, and in those cases, the calculations aren’t quite as simple. For example, suppose a similar company plans to make two products, Product J and Product K. It plans to pay $1,600 in direct labor to its workers. Product J requires 120 hours of that direct labor, while Product K requires 40 hours. The company also expects to pay $200 for rent, $150 for maintenance, and $50 for coffee. This step requires adding indirect materials, indirect labor, and all other product costs not included in direct materials and direct labor. 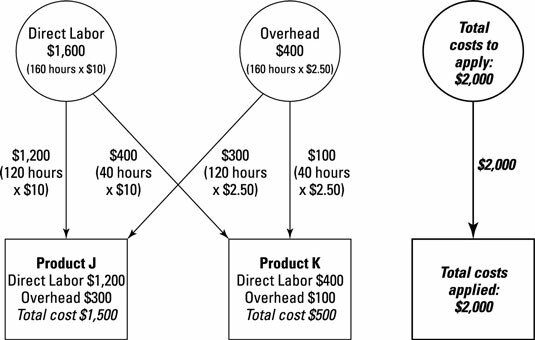 Here, overhead is estimated to include indirect materials ($50 worth of coffee), indirect labor ($150 worth of maintenance), and other product costs ($200 worth of rent), for a total of $400. 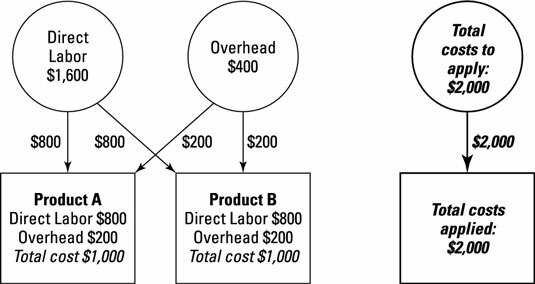 Compute the overhead allocation rate by dividing total overhead by the number of direct labor hours. For every hour needed to make a product, you need to apply $2.50 worth of overhead to that product. Some accountants and managers refer to the overhead allocation rate as the predetermined overhead allocation rate because it needs to be estimated at the beginning of a period. 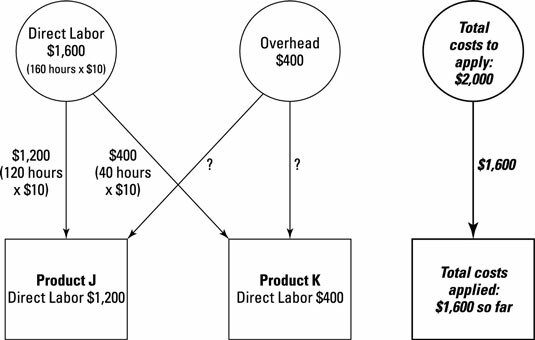 Apply overhead by multiplying the overhead allocation rate by the number of direct labor hours needed to make each product. Because Product J requires 120 hours, apply $300 worth of overhead ($120 hours x $2.50) to this product. Product K requires 40 hours, so apply $100 to that product.